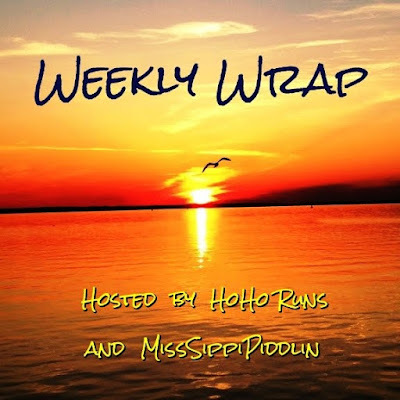 Welcome to another edition of the weekly wrap. Things were kind of simple here this week. I was a little more tired this week but still managed to get my three runs in. I want to start working on other things so I think a goal of two to three runs a week is still okay since I'm not planning a major long distance race. 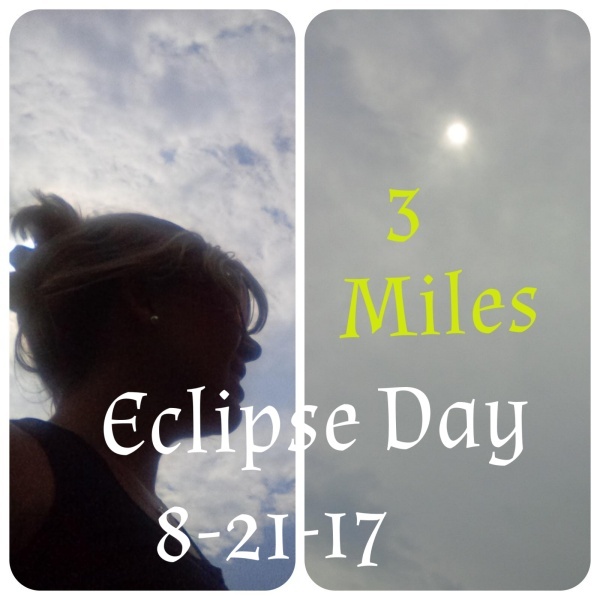 Of course Monday was the Eclipse and although we didn't experience total darkness here (it was just like a cloudy day), it was neat to see online all the folks having fun with it. As soon as it was over I went for my run. When the cloud coverage passed, it got super hot out! Afterwards I headed straight to the pool. Hot runs call for cool pools! Baylee and I decided to Savor our last days of summer break! Tuesday this happened, so I decided to just call it a rest day. Nothing ended up happening except maybe a bit of rain. I'm sure there was a storm some where but it seems like the weather people have been overly dramatic with their warnings lately. 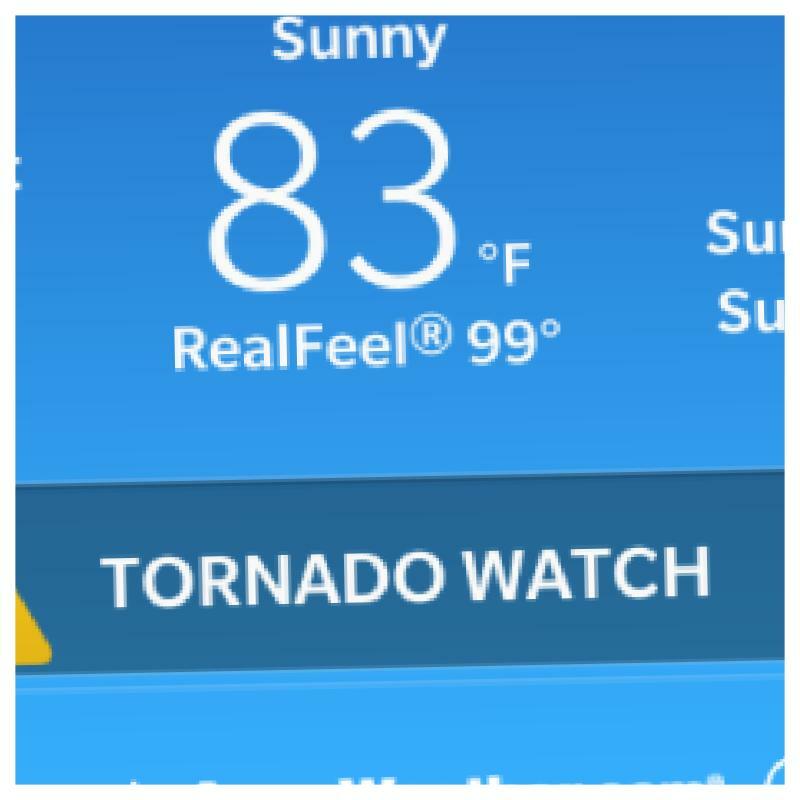 As long as I lived in this area we've never had a Tornado but we always get the warning. Better safe than sorry I guess. Wednesday I did 3 miles on the bike. Hey, at least it's something. Thursday I did another 3 miles on the trail but stuck to the grass trails because I knew that's where a majority of the race would take place on Saturday. It's been really bothering my back and hips more than usual to run on this grassy surface. Probably because it's uneven and it feels like it jolts my body. Friday Scott and I went for an evening stroll down at the island where the race was going to take place on Saturday. We decided to do the path in the woods so I could see if the trail was marked up yet. Indeed the trail had already been spray painted with orange arrows. Part of the course took an unsuspected turn, so I was glad that I was down there to check it out before race day or I probably would have missed it (more on that to come). Also on Friday evening I started to get a sore throat and hoped I wasn't getting sick. Saturday was race day. I'll talk more about this later. 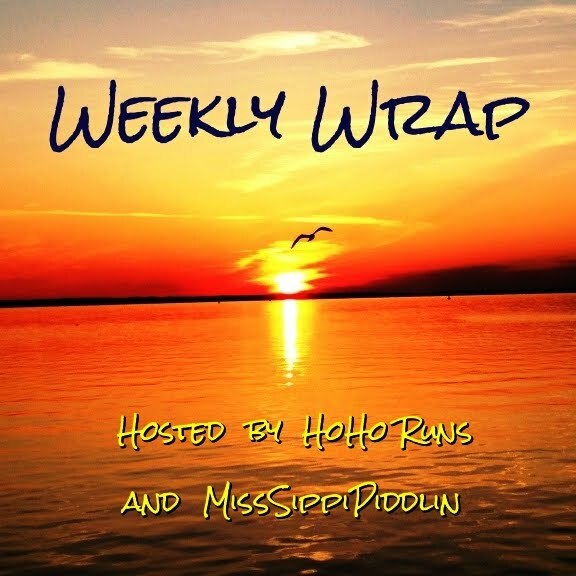 Be sure to check out HoHo Runs and MissSippiPiddlin for their weekly wrap series! I'm living vicariously through you since you still had summer break last week! :) It looks so relaxing. Do you swim nearly every day with Baylee? When do you normally close the pool for the summer? No, I don't swim every day with Baylee. There are actually lots of days where she swims by herself, like yesterday. I was so tired after the race that I laid out by the pool and let her swim. Although she doesn't let me rest at all because she always bringing me toys to throw in for her. We normally don't close the pool till the end of September. Even though I might not be swimming still, Baylee doesn't mind if the water is a bit cooler! I don't understand people who like to run on grass - I'm with you, it's uneven and uncomfortable to me. Love that picture of you and Baylee in the pool! I don't mind the trail but the grass does bother me. It seem like more of the trail is being overgrown with grass and I don't like that. 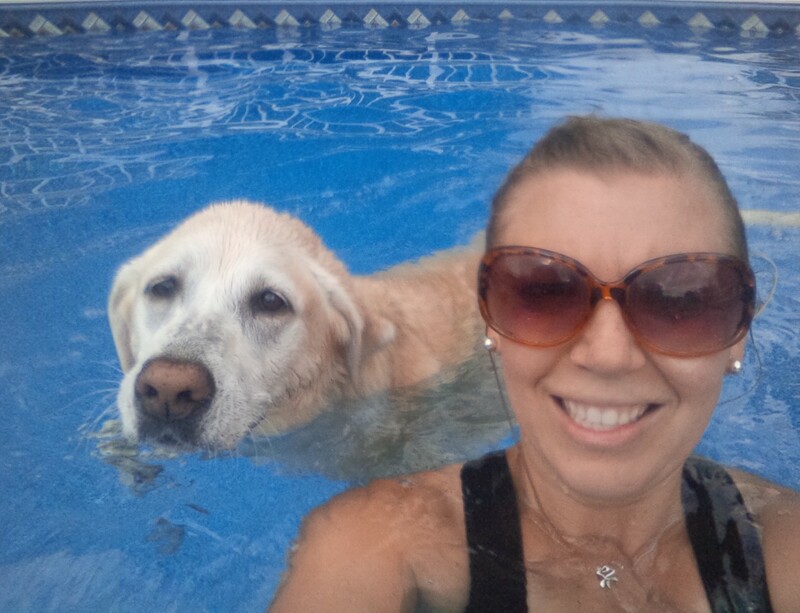 I will be sad when it is time to close the pool because I know how much Baylee enjoys it! Baylee's face in the pool picture is classic! I love her! Aww thanks! I have plenty of cute pictures of her in the pool! I do not like to run on the grass or sand - both are just very uncomfortable for me. Kudos! I love when I can get a run in early in the day. It makes me feel so accomplished! 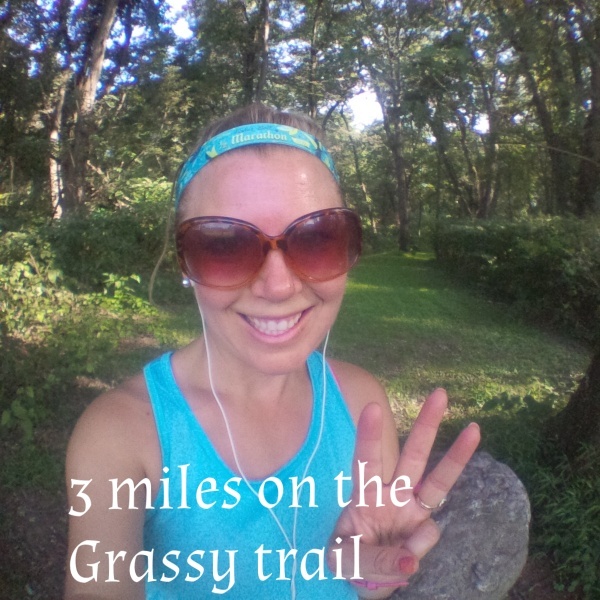 I think it would be pretty challenging to run on grass or trails. Its definitely different than running on pavement! I haven't been to the community pool this summer, and they'll probably close it after next weekend. It has been warm, but I'm hoping for cooler temps in a couple weeks. We don't close our pool till the end of September since Baylee doesn't care how warm or cool it is! Oh, I hope you weren't sick for race day. It's always good to preview a race course if you can! Some of this course is my normal route I run anyway but some of the paths were new. I read your post about that and that does sound amazing! Can't wait to read all about your race! Thanks for linking! My dog loves the pool too, so funny! It really is the best way to cool off though. I really wish we could leave the pool open all year long for her! Hopefully you aren't getting sick! Can't wait to hear more about your race! This week, one of my highlights was nailing my track workout after missing a lot of my paces due to heat and humidity. That grassy trail looks gorgeous! It's been a little cooler and less humid here. A hint of fall is in the air. It really is a beautiful trail! The highlight of my week was going back to work. Well, 3 days with my students and I was exhausted and beat every evening. Last days in the pool sound amazing!! I am not ready for fall!! still trying to drag out the last of the summer! Yup! I'm like that every year! It's nice to have a simple week!! I wish I had access to a pool...so refreshing! Looking forward to the race recap! Having the pool is a lot of work but definitely a nice addition. Hope race day went well! That was smart to go and check out the route in advance. Part of it is my normal route anyway so figured why not! Awww love that picture of you and sweet Bailey in the pool! Glad you had a good and laid back week! Hope the race went well! Oh no! I hope you didn't get sick. Looking forward to that race recap! You're lucky you could get there easily, mine was a half hour drive away so I definitely didn't check it out ahead of time. We had a tornado near us in VT once . . . you never know; better safe than sorry (it was a little one, though). Unfortunately I did get sick! The race course was near my house and that's the only reason I decided to run it. It may have been simple, but it was still a great week for you! My favorite part of YOUR week was the dip in the pool! Baylee looks like she enjoyed it too! I'm enjoying being out at the campground and the views I get to see. I do enjoy my dips with Baylee but know they are soon going to end soon! I bet your views are beautiful! I never do well running on grass. I am leery I will turn my foot or ankle.